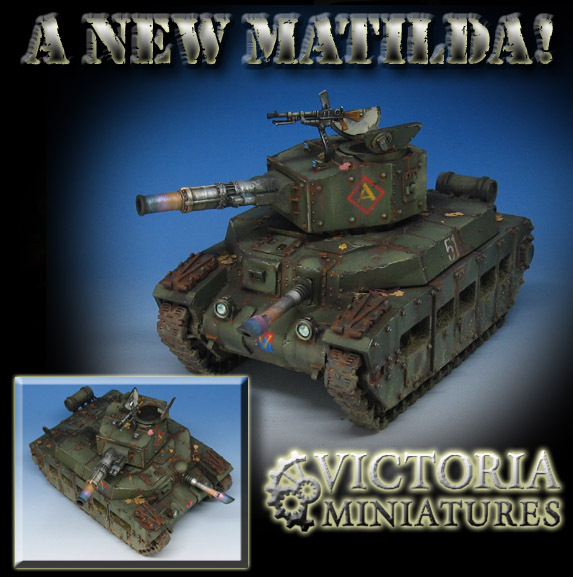 I have to say, it was quite interesting to work on the new Matilda "Boss" tank from Victoria Miniatures after painting two historical Matildas for Bolt Action! While I was able to carry across many of the techniques onto this massive beast, I needed to make a few new twists, and some discoveries along the way!! In regards to the Vallejo Metal Medium, that proved to be incredibly handy on all the weapon surfaces, as metallics were the order of the day on these. It was a material that I liked right away the first time I used it (I have a number of tutorials on that already), and since then I have learned more ways to take advantage of it. In this case, I was mixing it with the Secret Weapon Miniatures heat paints. It is a set of 3 (magenta, orange and blue), and I learned that those work best when combined with the metal medium. While the heat paints are quite thick, they are very translucent. This means that the metals will really show through, making your heat effects look like part of the metals instead of something that was merely painted on! I tried to come up with an insignia scheme that would be interesting, but also had a nod to WW2 historical markings. Some of you will recognize the diamond, which is one of several shapes used on British vehicles. There was also a very hilarious accident, in which I tried to replicate the unit type symbol frequently used on British vehicles as well. Well, it was not until later that I realized I had emblazoned the vehicle with several "V" for Victoria on the Matilda! Complete accident, I swear. I also used some of the Green Stuff World leaf cutters to make a few leaves scattered around in the areas where debris might collect. Lots of mud effects were done on the treads of course. This is just the first post in a series, because this vehicle comes with a TON or weapon options, including additional sponsons and even a different turret!! Stay tuned for the next post which will show many more of these very cool options!